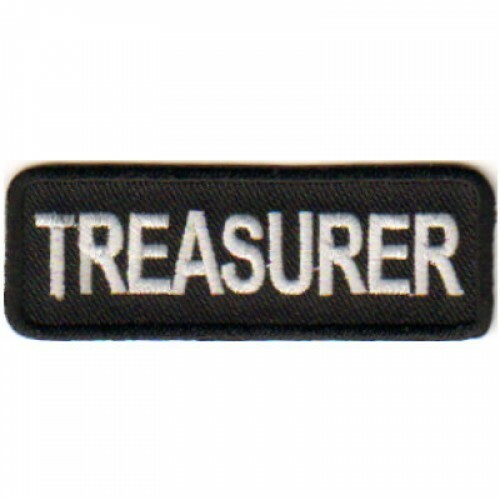 PatchesWholesale.com has hundreds of embroidered patches with free domestic shipping on all orders over $25. Biker patches,military patches,flag patches,hero patches,funny patches,ladies patches, back patches, kids patches, and Christian patches starting at $1 PRIORITY INTERNATIONAL SHIPPING available. 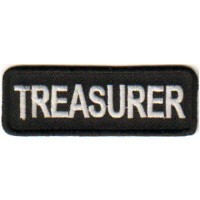 The Treasurer patch measures about 3 wide by about 1 tall. PatchesWholesale.com has hundreds of embroidered patches with free domestic shipping on all orders over $25. Biker patches,military patches,flag patches,hero patches,funny patches,ladies patches, back patches, kids patches, and Christian patches starting at $1 with PRIORITY INTERNATIONAL SHIPPING available.